FEACO has launched the 2016 edition of the Constantinus European Award. The annual international prize recognizes outstanding management consulting projects and showcases excellence in the field. Reflecting the dynamism of the field, the Constantinus Award strengthens the client-consultant-relationship through the celebration of successful joint endeavours in addition to raising the international recognition of their projects. The Constantinus Award is an exceptional opportunity for nominees to bring their expertise and innovation to a wider audience. 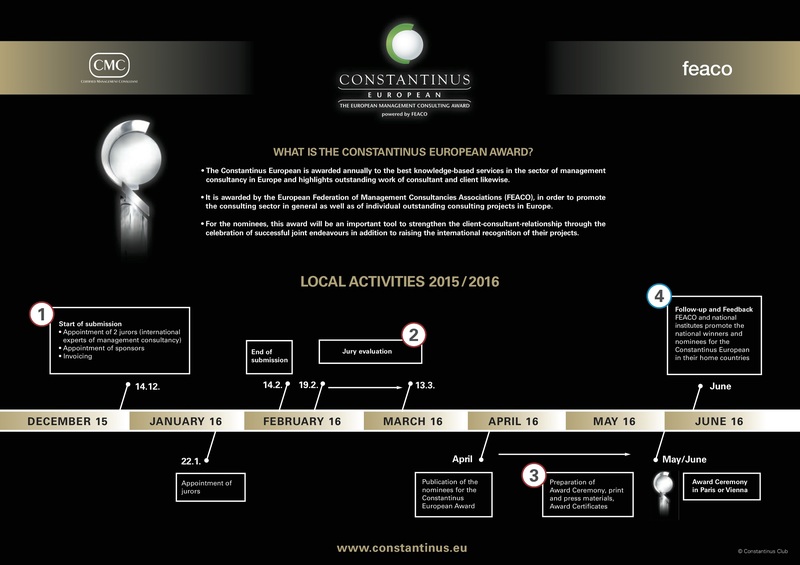 In 2015, more than 215 projects were submitted to the Constantinus Award. Eight exceptional projects were nominated after Evaluation by an international jury. The Constantinus Award 2015 was presented during the FEACO Annual Conference in Athens in October 2015. Following the participation of many national institutes last year, FEACO encourages applications demonstrating the accomplishments of the branch and inspiring future partnerships. Projects can be submitted until February 14th, 2016. The jury will be composed out of international experts in the field of management consultancy as well as of prominent representatives of successful businesses.